Let's discuss awards. The Finnish Game of the Year awards were handed out recently, much to the chagrin of the Finnish gamers. 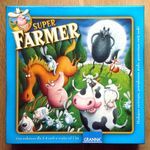 Super Farmer was chosen as the Finnish game of the year in the category of family games. This game, designed in Poland in 1943, isn't quite what I'd expect as the Finnish game of the year in 2013. 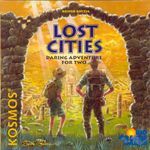 Previous winners are Ghost Blitz, Forbidden Island, Dixit, Zack Pack, Bandu, Ubongo, Snorta, Ticket to Ride, Carcassonne and Blokus. Super Farmer doesn't really measure up to the level expected. What do you think of these mass-market game awards? The fact is that consumers are generally not interested in very complicated level, but how low should these mass-market awards go? What kind of games should they highlight? Stuff that will sell a lot, or games that are very good? Do you follow any game awards? Which ones do you care about? Are there any awards that manage to at least somewhat constantly recommend good games? Included plays from the last two weeks since we missed a week. Karesansui was interesting with its "dutch auction" style bidding for a lot of stones for your personal rock garden. For a theme where one generally considers theme to be one of relieving stress, this one doesn't achieve that as you are calculating which lot of stones will best serve your needs to avoid points. I'd like to play again but use the weeds expansion next time which adds in some nastiness. My play of Rialto probably shouldn't count since we missed numerous important rules. Still, there was enough correct play that makes this feel like a typical TMG game for me - a 6 rating and a game I don't need to own but am glad to have a friend who does own and can play his/her copy. I'd rather play other Feld games than this one but this does probably hit the target TMG audience. Lords of Waterdeep: Scoundrels of Skullport really adds quite a bit more interesting flavor to the game by adding in corruption and new quests/intrigue cards as well as new goal cards. I wouldn't want to play just the base game any more. Expect the game to take a little longer the first couple plays though. Compatibility remains one of my favorite large group games (I own two sets to increase the total number of players to 12 and this does not increase playing time). Played this with my student staff and enjoyed watching them trying to figure out how the other person tends to think. As long as everyone plays this one honestly, this is a good game (obviously, one could talk beforehand and pick the same cards each time but what's the fun in that?). Revisited Terra Mystica again. I don't think I enjoy the game as much with less than four players as the map is just too open with two or three. I'm currently running a vote for the best board games of this year - another reason why awards are actual. A friend of mine voted for Lokomotive Werks, which was a bit of a surprise, but I decided that's a good game to play. Once I again I couldn't manage to win, but hey, who cares - Lokomotive Werks is fun to play anyway. I got some new games to try. Super Farmer is a stinker, but the others were good. 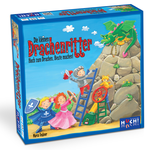 Die kleinen Drachenritter is more likely a 8, actually, as it's pretty good little dexterity affair for the kids, and it's fairly simple to handicap - let the kids choose their pieces, and let them choose the pieces for you. La Boca isn't the hottest game with kids, but I'm hoping to give it a go with adults this week. As I discussed in an earlier Amoeba post, we were in Spain at a wedding all last week. It meant good eating and beautiful scenery, but not much game playing. I did have one game-related objective, though. In perusing Friendless's stats site, I saw that there were only two dates on which I have never recorded a game play: September 7 and October 5 (mostly, I started recording on 1/1/2002, but I have 41 plays recorded before that, all of them wargames.) I decided I would try to play games on both of those dates this year, so we brought a Lost Cities deck along with us to Spain. Claire and I did manage to play two games on September 7. The first wound up in a tie, 98-98. In the second, I got some great draws and piled up a big score to win. When I got home I checked the site and found that I now have two plays recorded for September 7, but none for September 17. This is an error, no doubt introduced as Friendless (John Farrell's BGG username) is upgrading his hardware and re-writing some code to support the move. I'm back from Ireland (unfortunately). I suppose we had very un-Irish weather since it was warm and sunny most of the time, making it a splendid hiking trip. My short list of games played (spanning the last two weeks) contains mostly two-player games played during our trip. Friday August 30th was a monthly board game night, this time held at Micah's. _6_ Hanabi - Hanabi has really emerged to be to go-to filler in my gaming circles, which is not great for me, as I'm not that enthused by the game. The game started with Micah, but halfway through the game, he had to perform some hostly duty and was replaced by Jack. People thought this was okay since Micah didn't actually know anything about his hand, but suddenly adding a player who didn't know what other people knew about their hands was somewhat problematic. In any case, caution ruled the day, which seems usual in this game, and we finished with a score in the high teens. _9_ Terra Mystica - This was initially with me, Anni, Tom, and Nick (I think). Everyone at the table had played before, so I decided to take the Swarmlings, a race that I had seen work effectively, but had never played myself. We were joined at the last minute by a fifth player who was new, so we ended up having to go through a rules explanation after all (he seemed to catch on fairly well though). Turns out I probably should've chosen a race that would give me a bigger handicap, as I really just walked away with the game. I went to the stronghold on turn one to give me the easy trading house upgrade, and followed that up with a temple on turn two, with which I grabbed the bonus that gave me two points per house. I ended up burning all but four of my power, which is a little more than I'm comfortable with, but it's what was convenient. My initial placements were close enough to link via boats on the last turn, so I ended up with the 2nd largest group. By the end, I was upgrading my shovels just for the 6-point bonus. I had like 130, no one else broke 100. _8_ Macao - This was with me, Anni, Micah, and Nick. I fell behind early, as it seemed like everyone else was able to do more impressive things than me. I had early plans to create a large block of connected districts, but that was foiled by other players fairly early. I ended up having the slow boat, and did not make the first delivery to any city. I did manage to avoid taking any penalties in the early going--the only penalty I took was because I couldn't play my round 12 card. Eventually I got a decent money engine going, and started to catch up by taking the exchange points. Anni was doing really well, but I managed to edge her out by a point or so because of some end-game scoring cards. On Sunday September 1st Anni and I held a game day at our house. _8_ For Sale - This was with me, Micah, Anthony, and Stephanie. Anthony overspent on the early properties, and had to take whatever was left in the last part of the first round. Micah and I both did pretty well getting properties. In getting the checks though, Micah seemed to time things perfectly, which resulted in a big victory for him. I came in second. .10! Ra - This was with me, Micah, and Anthony. I'm not used to playing Ra 3-player, so I had to get used to trying to spend all four bids before the round was up. The first round was particularly long though, and Micah definitely came out ahead here. I believe he was the last one in the round, and walked away with a huge amount of monuments because of that. The rest of the game, naturally, proceeded much faster, and I don't think that anyone used all of their bids for the rest of the game. Pharaoh lead bounced between the three of us, and while I managed to obtain and flood a good amount of Niles, I couldn't really compete with Micah's monuments in the end. Micah won by a lot, but I was well ahead of 3rd place Anthony. _5_ Escape: The Curse of the Temple - This was with me, Brian, Micah, and Jack, I think. Brian likes uses Super Mario Bros music instead of the music that comes with the game, which definitely adds a layer of silliness on it. We were playing with the treasures and curses expansion, but since I was moving slowly, I never had to deal with any curses. Something bad happened though, maybe I failed to get back to the center at mid-game, causing me to lose a die. At that point, I was just tagging along and helping where I could. Eventually, we all managed to escape successfully. _8_ Caylus - This was with me, Anni, Micah, and Debbie. I often like to pursue the building track in Caylus, but boy was this not the game to do it. Everyone except me was building wood buildings like crazy, and by the time I managed to get my stone building favor, two of the 3-resource stone buildings had already been built by the stone building site, and that was after the gold mine. Obviously I was way behind, but I still tried to build up some gold, and by the end, I was the only player who was able to construct a blue building. Despite this, Micah was way, way, way ahead of everyone. _6_ Hanabi - This was with Mark, Jack, and Kyle, who was playing for the first time. Kyle understood the hints that we were giving him, but ended up playing a little too carefully, which frustrated the rest of us. For example, we told him that he had 3 ones on the first turn, so he happily played one of them, but held on to the other two since he didn't know if they were duplicates. Naturally, we would have told him with more clues if he needed to be that careful, but he didn't know that. Regardless, we ended up doing pretty well, and scored in the low 20's. _9_ Navegador - This was with me, Anni, Micah, and Brian. I thought I would try doing a Factories and Churches strategy, since that works pretty well against newer players. I got a couple of Gold colonies to start me out, and then loaded down on Sugar factories and Churches where I could. I also made sure to get priviledge tiles when I can, though this often backfires on me in the late-game when I have all the priviledges I need and don't have a good use of that space. Anni loads up on Sugar colonies and takes control of the economy, while Micah goes for Shipyards and Exploration and Brian does a little bit of everything. I end up being pretty money-poor the entire game, because my Factories are only useful after Anni goes to the market, which she doesn't really do that often. I get a lot of competition over the Factories from Brian, but I pretty much have all of the Churches to myself. When the game ended, I had six churches, but only around 8 factories, which was not enough for the win. I think Anni won, but it could have been Brian. On Monday September 2nd (Labor Day in the US) we went over to Micah's for an impromptu game day. _8_ Race for the Galaxy - This was with me, Anni, Tom, Micah, and Brian. I started out with Old Earth, and tried to run a produce/consume strategy off of that. I don't really remember the specifics, but I did okay and didn't win. _8_ Modern Art - This was for some reason billed as a filler that we'd stop playing as soon as some other people showed up. Obviously that's not my favorite way of playing things, but there wasn't anything else going on, so I played. Same group of people. I judiciously decided to save my double card for a second round that didn't happen. The artists that I invested the most in ended up coming in third. Brian "won" the first round, and we just started the second round when more people showed up, so Brian was declared the winner. _9_ Vegas Showdown - This was with me, Anni, Micah, and Cary (who is Marc's less-than-teen son). Cary ends up getting tons of the base room, while Micah loads up on Slots and Fancy Slots. Anni and I are playing a little more prudently, trying to save up for more valuable rooms. I do as I often do and only end up getting one of each of the base rooms. I grab an early Sports Book to help my income, and get a couple of Fancy Lounges and a Fancy Restaurant fairly early. Anni gets an early Night Club, but it's okay, as the Theater has just hit the table. I easily win the Theater, and actually used it to fill up my hotel section. I also got the Five-Star Steakhouse, after which the card that gives you points for red corners comes up. I score like 11 points off that one card, and I don't think anyone else scored anything. I filled in my last little hole in my red corner area with a Fancy Restaurant on the last turn, giving me huge points for corners. Unfortunately, I didn't have a completed casino section or a connection, but I more than made up for that with my in-game points and my corners, which gave me an easy victory. _8_ Automobile - This was with me, Tom, Marc, Brian, and Mark. I hadn't played this in years, so I was a little rusty strategy-wise. I do remember having played games where players lost because they were too cautious, so I tried to make sure that wasn't me. I took the build-and-extra-factory guy on the first turn, and invested two factories and a parts factory into one of the early mid-size slots. I avoided salesmen because I didn't think I needed them, but I ended up having a car go to waste. On the second turn, I grabbed Howard, built a luxury line, produced two luxury cars, and sold them to Howard, along with all of the mid-size cars I built and sold to general demand. Again, I avoided salesmen. On the next turn, I knew I had to shut down my initial factories, so I decided to try something different--instead of investing heavily in one line, I could have one factory in as many lines as possible. This would avoid the problem of having a huge stack of cars on one spot, which would inevitably go at the end of the queue. So I took the role that let you build a factory before the turn started, and tried to pursue that strategy. It worked pretty well, I think. I was the only one who didn't end up having to take a loan, and I didn't end up accumulating that many loss cubes. Ended up finishing in second place to Tom. _8_ Race for the Galaxy - This was with me, Brian, and David. I started with Earth's Lost Colony, hoping to get the placard that gave points for the most blue/brown worlds. I immediately drew Alien Toy Shop, which I obviously had to play. Unfortunately, I didn't see another production world until the very last turn of the game. I did get the development that gave me a point in each consume phase, and the 6-pointer that gave me 2 points for each production world (which I used as the 6-pointer that gave me 2 cards in each produce phase). I switched to Consume 2x before I really felt comfortable doing so, but I don't really think I had a choice. Unfortunately, Brian was playing a military strategy, and had gotten out Hive World with the Trade League. So every time I produced and consumed, he traded a green good. I finished with a fairly impressive score, but Brian got everything he needed thanks to me, and won fairly easily. Saturday September 7th was a monthly game day at Mike's. _9_ Saint Petersburg - This was a five-player game with me, Anni, Micah, Anthony, and Gene, who was not only new to the game, but was new to hobby games in general. We talked not using the expansion New Society cards, but in the end, we decided that trying to play with five without New Society would be too short, so we included them. Gene seemed to catch on just fine. I got a first-turn Observatory, which is always good, even at a cost of 8. Micah bought five Markets, and then started upgrading them one by one. I was able to get a variety of aristocrats fairly early (with help from the Observatory), and my income is very good all game because of it. In the end, though, I didn't get very many aristocrat upgrades, so I didn't have that many more than anyone else. Micah ended up winning by a good ten points or so, but I was a strong second. _6_ High Society - This was with the same group. I ended up getting the x2 card before I got any other card. Unfortunately, I was unwilling to bid high enough to get the 9 or the 10 cards that came up afterward. I needed to get something, and High Society is not always about getting the best deal, so I ended up getting a 7 card. Of course, that also put me at the least money (I wasn't counting, so I didn't find out until the end). I think I still would have lost even if I didn't have the least money. So there. _9_ Age of Steam - This was with me, Micah, Tom, Ohr, Jun, and Gene. I've never played Age of Steam with six before, and I can't say I really recommend it--the board is just too crowded. I started out with a north-south route in the middle of the map, and everywhere except the west got super-crowded right away. I eventually managed to work my way out to the wide open west. Unfortunately, I somehow managed to get sucked into a subsistance death spiral--if I took out three shares on every turn, and passed on bidding, I could extend my network a little and break even on every turn. In retrospect, I guess I should've been more aggressive. I was able to emerge from the death spiral by the time I maxed out on shares, which is good I guess. As I'm sure you realize, I wasn't anywhere near winning this game--I finished in fifth, behind two newbies and in front of another. Micah won easily. _5_ Ghost Blitz (new!) - This was a filler that Tom brought, he taught but didn't play. It was me, Micah, Ohr, Jun, Gene, and Natalie. I'm not particularly good at dexterity games, but I had even more difficulty figuring out what piece to grab. So I guess the speed element hurt me more than the dexterity element. In any case, I managed to claim two cards all game. Micah did similarly. Ohr and Jun turned out to be really good at this, and I think Jun won with 30-some cards. _8_ Le Havre - This was with me, Anni, Micah, and Tom. I don't play Le Havre that often, but I don't think I'm completely incompetant at it either. Well, in this game Anni and I pretty much did random stuff while Micah steamrolled us all. I ended up getting the first Wharf, which was okay, but I missed out on the other nice early buildings. I ended up buying the cheap Building Firm so I could get more goods with Micah's Marketplace, but then I sold it later so that I could have the activation cost for another building. Unfortunately, I realized that was my only hammer symbol, so I couldn't use the Coilery (which of course Micah had) as effectively. I picked up the Cokery and the Steel Mill late, but since those are buildings that people typically only use once, it was really mostly the points. I was actually set up nicely to score a lot of points from the Bank, but unfortunately it was buried under another building that no one else built and I couldn't double-build. I picked up a Steel Ship near the end, opting for that over a Luxury Liner because I was hoping I could use the third steel on the Bank, but alas. Micah did the usual thing, getting a ton of coal, turning it into coke, and then shipping like crazy. He won by a lot. _7_ London (first edition) - This was with me, Anni, Tom and Steve, the latter two of whom were both new. I've found that a lot in this game depends on whether you get one of the high-income brown cards in the first few draws. I did not, which made me a little grumpy. I ended up building a largish tableau of 5-6 cards, but many of my cards didn't flip and reduced poverty. I also picked up some nice victory point cards during the course of the game. However, I was doing a terrible job just with overall efficiency--it seemed like whenever it was time to run my city, I had 2 cards in my hand, so I wasn't really doing particularly well in the poverty department. Steve was doing very well getting rid of his poverty, so I ended up taking 15 penalty points at the end of the game. I think I had the highest score before being penalized, but I think Steve ended up winning it in the end. Guys, guys, I did it! I played a board game yesterday! And I'm gonna play some tonight too! AND tomorrow!